What’s that dance where people shuffle their feet to fast (and even really fast!) swing music as they glide along the dance floor? Balboa is the dance! 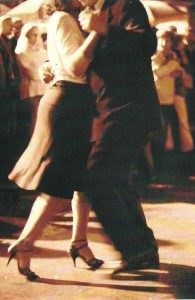 Tradition holds that Balboa was developed primarily in the Southern California/Los Angeles area in the 1930’s, as a result of very crowded dance floors in ballrooms. 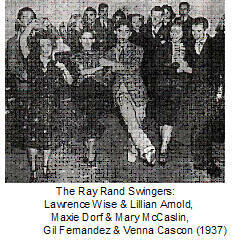 The dance was supposedly named after Balboa Island in the Newport Beach area which was the location of the Rendezvous Ballroom. The dance is known for its closeness, fast and fancy footwork and effortless looking flow and an overall look optimized for fast swing music. By the mid 1930’s, it was not unusual for ballrooms to host dances for 3,000 or more people. (The photo to the left shows about 6,500 dancers at the Palladium Ballroom in Los Angeles dancing to the Glenn Miller Orchestra in the late 1940’s!) As ballrooms became more and more crowed, dances like the Charleston and the Lindy Hop became less practical; some ballrooms even instituted “no breakaways” policies to prevent injuries. After a while some of the original Balboa dancers grew tired of doing just pure Balboa and started to introduce fancier variations which forced the close connection to be broken. Today, this is often called Bal-Swing. In this form anything goes: spins, turns, dips, tricks, slides, etc. Bal-Swing variations keep the overall style, feeling, and framework of the original dance with recognizable Balboa footwork. A few technical aspects of the dance. Because of it’s simplicity and economy of movement, Balboa is well suited for dancing comfortably to faster tempo music, i.e. 190 to 250 beats per minute or higher. This has meant that Balboa is sometimes thought of as a fast dance. Indeed many of the original Balboa dancers could dance at extremely fast speeds, but they also liked to dance Balboa to slower music. Balboa is very popular with swing dancers today. The original or “pure” Balboa is danced in closed position, with a fairly upright posture and with the dance partners’ torsos touching. Most of the variations in “pure” Balboa are footwork based. Balboa has an 8-count basic pattern not like the traditional Lindy Hop basic pattern. Balboa looks like cartoon dancing, with lots of fancy footwork, feet using a “shuffle” type basic that hardly leaves the floor. The upper body remains still and the dance does not normally travel much around the room on the social dance floor. What does Balboa look like? Where can I learn Balboa in Lexington? (1) Mike & Mary sometimes teach Balboa, either in a class or workshop format. We don’t teach Balboa as often as Lindy Hop, so when we do offer Balboa classes or workshops, take advantage of that! Keep an eye out on the Hepcats classes web page for info. (2) Private lessons. Want to learn Balboa but don’t want to wait for the Hepcats group classes – and- want to progress at a much faster rate? Take private Balboa lessons with Mike & Mary! Private lessons are an excellent way to learn Balboa, given the unique and sometimes subtle character of the dance. For Balboa, the individual attention from working one-on-one with the instructors is a big help in progressing at a much faster rate. Contact Mike Richardson at 859-420-2426, info@luv2swingdance.com for more info on learning Balboa. Listed below are some weekend workshop Balboa events. You should also check out the Hepcats calendar page; and the Swing Planit web site for the most up-to-date info. o All Balboa Weekend (ABW), Independence, OH (about 15 miles SW of Cleveland, normally takes place the 2nd or 3rd weekend of June): About a 5 hour drive from Lexington, this is the premier Balboa event in the Lindy Hop / Balboa swing dance community for live music for dancing, workshop classes, and competitions. For Balboa dancers this is a must attend event. A note from Mike & Mary about ABW: “We’ve been dancing Lindy Hop and Balboa for quite a few years, and over that time we’ve attended a lot of weekend workshop type events, regionally and nationwide. There is one weekend workshop event that stands out for us, one we make plans to attend every year: ABW. In fact, ABW is an event that we’ve never heard other Balboa enthusiasts say anything negative about, or heard other Balboa enthusiasts not recommend the event to other swing dancers. We know ABW is not “cheap” when compared to exchanges, a typical DJ dance, etc…but people (to include swing dancers) make choices all the time about how to spend their money and one of those choices for swing dancers should be to attend ABW. Don’t be a person that “knows the price of everything and the value of nothing”. When you consider what you get at ABW – world class instruction, high quality music (both live and DJ), high level competitions, high quality social dancing with hundreds of other Balboa enthusiasts – ABW is a great value. o Bal-Astoff, Huntsville, AL. Normally takes place in early August. o The Great Lakes Balboa Escape, Chicago, IL. Normally takes place in mid August. o JingleBal, Cincy, OH. Normally takes place in early December. o California Balboa Classic, LA area. Normally takes place in January. As noted above, this list is certainly not all inclusive….check out the Hepcats calendar page; and the Swing Planit web site for up to date info.